*$52 for 24 months. Minimum purchase required. 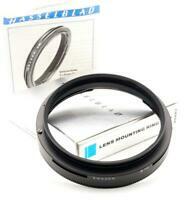 Hasselblad XH adapter for Mounting HC lenses on X1D body - Minty!!! Hasselblad Extension Tube 16E #40654 " Blue Stripe Line" w/ Box - Near Mint!! Sales tax may apply when shipping to: AL*(8.36%), CO*(6.47%), CT*(6.35%), GA*(8.0%), HI*(4.24%), IL*(6.25%), IN*(7.0%), IA*, KY*(6.0%), LA*(9.58%), ME*(5.5%), MD*(6.0%), MA*(6.25%), MI*(6.0%), MN*, NE*(5.86%), NV*(7.78%), NJ*(6.63%), NC*(6.9%), OK*(7.86%), PA*(6.1%), RI*(7.0%), SC*(7.36%), SD*(5.6%), UT*(6.61%), VT*(6.04%), WA*, WV*(6.1%), WI*(5.46%).